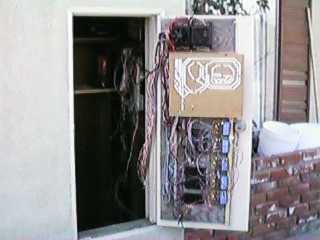 The control equipment is mounted on the back of a small door so that it can be protected from the weather, but still remain accessible and permanently connected to the layout. Putting away the controls involves merely closing the door. At the top are two Aristo Train Engineer receivers, one for each of the two cabs. Below that is a panel with the cab control and turnout routing manual controls. Below that is a mess of wiring and five Aristo ART-5474 Accessory Panels that allow the turnouts to be controlled remotely. Behind the hinged panel is a board that contains a diode matrix that determines which turnouts go which way for each route command from the 5474's. There are also five small circuit boards with custom converter circuits similar to those found at Aristo 5474 Tips which reformat the outputs from the 5474's to the configuration that I needed.